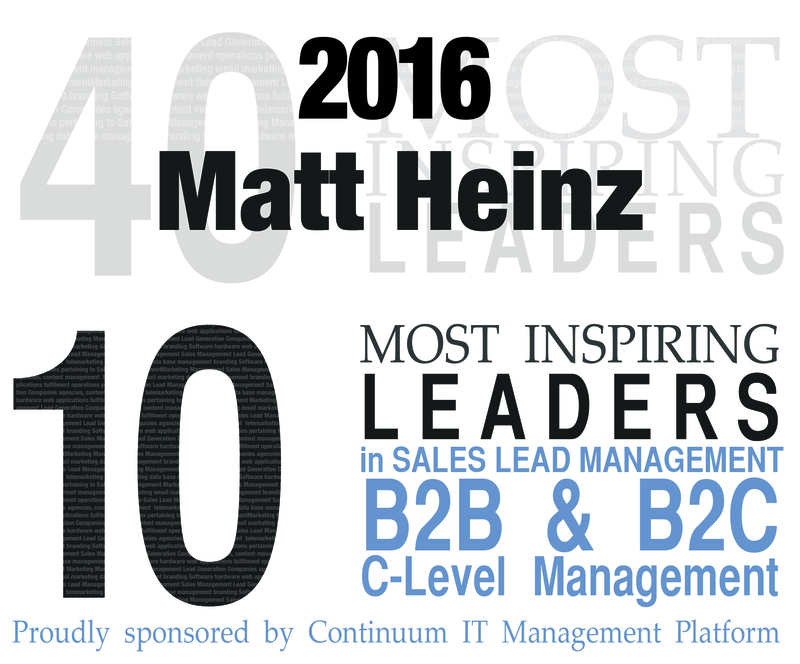 Everyday at Heinz Marketing brings a new adventure in the world of B2B sales and marketing. We are innovators at heart, and not afraid to challenge convention in order to deliver the results our customers need. We are passionate about what we do and strive to promote outcomes rather than just focus on activities. To be stagnant is to be ineffective. There is always more to learn about our craft! You can read more from Matt on his blog, Matt on Marketing, follow him on Twitter, or check out his books (listed below) on Amazon.com. Maria Geokezas specializes in developing and executing customer acquisition, retention and loyalty initiatives. With over 20 years of experience, she has overseen every step of the customer life cycle and managed multi-channel B2B and B2C marketing campaigns. Her integrative approach and collaborative style delivers quantifiable results in cost per acquisition, customer lifetime value and marketing ROI. Maria helped Harley-Davidson launch their popular co-branded rewards card, oversaw the REI membership program, and expanded the customer base of local companies like HomeStreet Bank and Washington Mutual. She lives in Seattle with her husband and no pets. In her spare time she enjoys traveling, skiing, wine tasting and yoga. Sheena has been doing administrative work, literally since 6th grade when the principal asked her to be a helper in the school office. Over the past many years since studying Business Administration in college, she’s excelled in Office Management, Registration/Communications, and Executive Assistance. Her experience spans industries as diverse as Development, Health Care, Retail, Importing, Construction, Education, Finance, and now B2B Marketing. In her previous two positions, spanning 15 years, she enjoyed being actively involved in several aspects of marketing. Sheena lives with her husband in Sammamish along with their Australian Shepherds and an old cat. She looks forward to her dinner/wine group and neighborhood book club gatherings and in her spare time she loves decorating and playing with her granddaughter. After graduating from Seattle Pacific University in June of 2015 with a Bachelor’s degree in Communication Studies, Josh Baez joined the Heinz Marketing team that September. Responsible primarily for inbound lead generation, Josh manages social media campaigns, client blogs, newsletters, and emails. He also has a background in design and copywriting, bringing to the table new perspectives and ideas. In his free time, Josh has a passion for music—having released three full-length records and a handful of smaller releases as of October 2015. He also loves geek culture, travelling, and baking. Lisa has more than 15 years of B2B marketing experience, with a passion for marketing technology and operations. She is responsible for driving successful client engagements and ensuring every project benefits from all of Heinz Marketing’s collective expertise and capabilities. Lisa graduated from the University of Washington in 2003 with a major in Business Administration and a concentration in Marketing, and went on to earn certifications in Graphic Design and Technical Editing. She is also a Marketo Certified Expert. She lives in Kirkland with her husband and their two young boys. In her (rare) spare time she enjoys reality TV, wine tasting and musicals. For the past 20 years Chris Goetze has developed hard-working B2B marketing solutions for numerous clients, including Microsoft, F5 Networks and Fluke. Prior to joining Heinz Marketing, Chris ran his own B2B consultancy, LIFT Strategy, which was widely known for its digital demand generation programs. Chris’ mix of marketing, creative and technology backgrounds is a boon to Heinz Marketing’s clients, who can leverage his extensive experience in lead generation and online advertising. His mission at Heinz Marketing is to provide the highest level of client service by delivering measurable results that make a positive impact for our clients. Chris lives in Seattle with his wife and three daughters. In his spare time he enjoys fly fishing, playing guitar and sipping fine bourbon. Stephanie has over 12 years of experience in digital marketing strategy running B2C and B2B marketing campaigns. She is passionate about user experience and analytics to drive results. Stephanie’s responsibilities include the development of marketing acquisition campaigns for Heinz Marketing clients and establishing successful marketing programs. Stephanie graduated from Washington State University and has managed digital marketing and product development projects for companies like Microsoft, AT&T, and Lindal Cedar Homes. She spends her free time traveling, exploring local breweries, hiking with her family, and photography. Brenna is a graduate of Washington State University with a major in Marketing and a minor in Communications. Brenna is responsible for coordinating and implementing demand generation programs for Heinz Marketing clients. Brenna is an expert in developing and running high-yield campaigns through multiple owned and paid channels, including LinkedIn, Google, Twitter, and FaceBook. Brenna also provides analytical and attribution services for clients. She has brought over her experience at Microsoft Bing Ads in Search Engine Marketing and is excited to apply that knowledge and is now a Certified Marketo Expert. In her spare time she enjoys being active and doing anything outdoors, watching Seahawks games and trying new places to eat. Go Cougs! Lauren Dichter joined the Heinz Marketing Team after graduating from the University of Washington with a Bachelor of Arts in International Studies and a Professional Sales Certificate from the Foster School of Business. She started out at as a part-time intern during the last quarter of her senior year and we snatched her up before she could get away. While she is primarily responsible for coordinating and communicating with clients, Lauren also focuses on writing copy and producing dynamic strategies for sales enablement, and doing some inbound lead outreach. In her free time, you can find Lauren at a Husky football game, eating good food, or spending time with family and friends (maybe even all 3 at once). Go Dawgs! Kailee graduated with her Bachelor of Science degree from Washington State University in 2017 with a major in Wild Life Ecology and a minor in Art. She helps the Heinz Team remotely with database and social media management tasks. She is currently working on her Masters Degree in Natural Resources at the McCall Outdoor Science School in McCall, Idaho. In her spare time she likes to take hikes with her mini Australian Shepherd, Bentley. We are always looking for talented people who have a passion for marketing. See what it’s like to work at Heinz Marketing.